A new body tasked with shaping the nation’s long-term education vision will be formed by August at the latest, Education Minister Kim Sang-kon said Wednesday. “The ministry is in works with Cheong Wa Dae to prepare for its launch around early August. Details are still to come, but we have around 25 candidates under consideration to join the envisioned panel,” Kim said at a press conference. It was President Moon Jae-in’s campaign pledge to establish a new committee that decides key directions of the nation‘s education policies. Moon, a liberal politician, has vowed to promote fair opportunities for all students as a way to reduce widening social disparity. In face of growing criticism that educational policies are increasingly short-lived along with each new administration, experts have long stressed the importance of setting up long-term goals and policies in education. 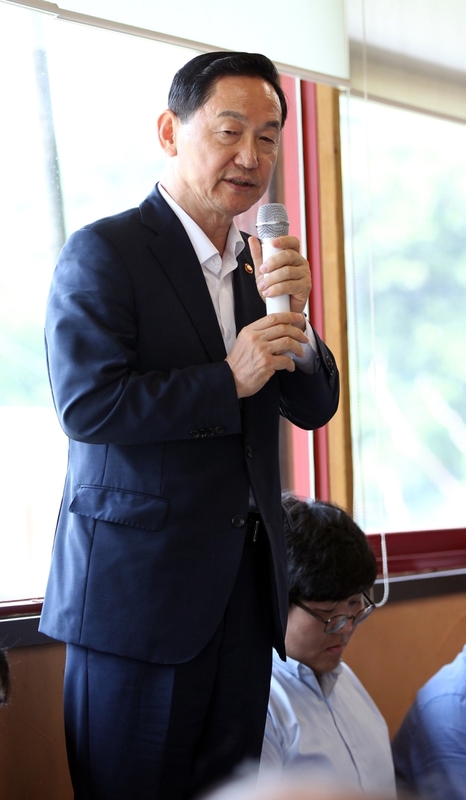 For a start, Moon tapped Kim, 68, a former school superintendent of Gyeonggi Province and educational reformist, as the new education minister in June. Sworn in last week, Kim is said to be the architect of Moon’s education pledges, including the removal of elite private schools here and excessive competition among students. Also at the conference, Kim emphasized the need to bring change to the ministry itself, to better cope with rapidly changing educational environments around the world. “A whole new approach is needed to reform the ministry and realize the Moon administration’s educational philosophy and goals,” Kim added.